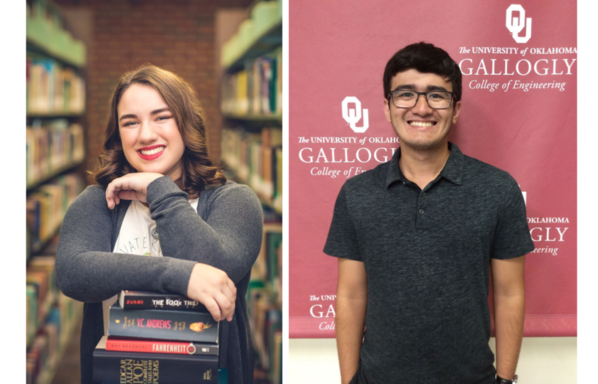 OKLAHOMA CITY (Dec. 3, 2018) – Abigail Ferrell and Michael Cox, 2018 graduates of Edmond North High School, have been named AP Scholars. The awards are given annually to one male and one female student in each state and the District of Columbia for outstanding achievement on Advanced Placement (AP) exams. Ferrell, currently at Oklahoma State University studying psychology, is confident her participation in AP courses at Edmond North has made her a better college student. Cox is attending the University of Oklahoma and pursuing a double major in mathematics and mechanical engineering, an accomplishment he believes would not have been possible without his AP credits. Both Ferrell and Cox graduated high school with more than 60 college credits, satisfying nearly all of their general education requirements for their freshman year. Joy Hofmeister, State Superintendent of Public Instruction, applauded the pair. Since 2016, five of the past six AP Scholars have come out of Edmond Public Schools. “To reach this level of greatness requires a tenacious, purposeful pursuit of academic excellence, said Edmond Superintendent Bret Towne. “We could not be more proud of these two Edmond North High School graduates, and we look forward with great enthusiasm to what they will accomplish in their futures." Both students credit their Edmond North teachers for their successes. Students enrolled in AP courses have an opportunity to earn college credit while in high school. More than 17,000 Oklahoma public school students took an AP exam during the 2017-18 school year.